A desert village provided the neutral location for this afternoon's match between Pravda High School and St. Gloriana's Girls College. The match was a 10-A-Side flagtank competition; eliminate your opponent's flagtank to win. Early in the match St. Gloriana's flagtank with two Matildas escorting broke free from a five tank ambush skilfully employed by Pravda which led to a chase. The four Crusaders attempted to deploy around the back of Pravda's flagtank only to be caught themselves by a pair of T34-85s, losing a Crusader before escaping round a corner. Emerging into the village square the three remaining Crusaders were met not only by Pravda's captain Katyusha in her T34-85 and another T34-85 as well as the flag-T34, but also the two 85s from earlier who had been recalled to aid in defence. A Crusader stopped by a building to enable her teammate, the best driver, to use the vehicle as a ramp and drive onto the building's roof from which Pravda's flagtank could be targeted, firing over the intervening T34-85s that were otherwise proving an invulnerable shield around their flagtank. Meanwhile Pravda's ambush force had surrounded and trapped the elusive Darjeeling, a hit damaging her Churchill, but its armour held, so close to a win for Pravda. Moments later, however, help had arrived for the Crusaders, two Matildas emerged from a patch of woodland and damaged a T34-85 which was blocking shots on Pravda's flagtank. Katyusha's tank was damaged in the exchange, a comrade began to push her tank sideways to an out of sight position where repairs could be made. Seizing their chance St. Gloriana's Firstyears in their Cromwell eliminated Pravda's flagtank to win the game. Post match comment from the winning Captain; "The foolish rooster sticks head in lawnmower". And a word with the losing Captain; "You will be purged". Maho. "Tactically that match resembled The Gunfight at The OK Coral more than a well planned armoured engagement." Miho. "That was exciting. Darjeeling won." Maho. "What has become of my sport?" Looks like it was a fun game. Don't underestimate the Firstyears! What is the tank doing on the roof??? Hats off to you Twig. Now that is a war game! Once I started to read, the opening theme started to playing in my head. Great AAR. More more more more more !!!! Updated rules and stats after watching "der Film", also includes tankettes. Oh, and moar AARs please! And I will probably succumb to doing this in 15mm too. Sigh, yet another WW2 scale. But the Zveszda and Plastic Soldier Company tanks are at a very sweet price spot. I will try to maintain an iron will and finish up the BattleTech Alpha Strike battalions before purchasing on tankies though…. Since I'm new to 15mm tankery shopping, which kits have you found best for filling out the teams? And which metal ones for models not available in plastic? I am in the opposite situation. I am trying to keep an iron will and finish painting Chihatan and not to build any more giant robots, I have enough for the Build Fighters gunpla battle game I want to play but…. I used Plastic Soldier Company and Zvezda as well as Peter Pig, Skytrex and Battlefront, looking for what I wanted in roughly that order. Pravda are all PSC except for the Zvezda KV-2. St. Gloriana's have a PSC Cromwell, Zvezda Matildas, a Battlefront Churchill and Crusader 2s, Skytrex Crusader 3s. I think the Skytrex Crusader is a nicer model than the Battlefront ones. Black Forest have PSC Panthers, Tiger and PzIII, Peter Pig JgdPzIVs, to get a JagdPanther looking like the one in the series I used a Peter Pig top on PSC running gear and back. Battlefront Tiger IIs and JagdTiger, Peter Pig Maus. The Elefant is a Zvezda Ferdinand with a coupla from a Panther and hull MG from the Tiger kit. The Plastic Soldier sprues are good for bits of track and fuel drums and so on to get the details to match the series. Chihatan are all Battlefront. My brother painted Oarai and Anzio, I can ask what is what, any ones in particular? We don't have Saunders or The University Team yet, or a BT-42. The tanks have magnets under the commander's hatch and I used N Gauge railway figures with greenstuff hair and a 1x1mm magnet in their body for the crew. Start with a 5-A-Side game and go from there. Thanks — that's plenty of information to help me approach diving into the 15mm tank market! I'll see what my FLGS has on hand from those to start with. The N-scale figures is a brilliant way to the right proportions for the crew figures. Did you just to stop frame viewing of the DVDs, or did you find any of the various sourcebooks or the encyclopedia useful for detail modelling? I have held out jumping into this up til now with the [forlorn] hope that Dragon would release pre-painteds in 1/100 or 1/144. But since they didn't do that in conjunction with the movie, I'm ready to concede that they just won't be doing that. In other recent news, the Alpha Strike develepors are starting to tweak the PV of mechs, so my work on battalions may come to a natural resting point a bit sooner to await new costs being finalised. I have plenty of lances and companies done now for playing, and it will make sense to stop after just a bit more work and then wait for the new PV costs before doing the ensuing juggling of unit compositions to polish up the battalions. After meditating on the transitional state of Alpha Strike PV's, I am indeed happy to leave my battalions at about 60–70% of the detail work finished up and the remainder in a not-polished but still playable state for the nonce. And so the madness has begun. Just picked up a PSC M4A4 75mm/Firefly platoon pack and a T-34 76/85mm platoon pack from the Hobby Bunker. WIll order other single sprues direct from PSC to fill out the starting squads rosters for Saunders and Pravda, as well as St Gloriana and whatever they have to for Oarai. You just need a KV-2, JS-2, a 76mm Sherman and a C-5 Galaxy now. The Plastic Soldier kits especially have several options for barrels, mantlets, road wheels, and so on. That is where I found it useful to watch the episodes on the computer and pause, and save image, to get a left, right, front, etc view of each vehicle. Then you can scroll through the folder when building/painting. The only bits of information we used from outside the series and film were the existence of St. Gloriana's Cromwell and, in the manga, Anzio use some Carro Armato M13/40 tanks. Saunders vs. Pravda sounds really good. Enter Mission. Just put in the order for single sprues and Zvezda from PSC. So that covered the 3 tanks you mentioned for Pravda and Saunders (M4A1 76mm). No C-5 alas! Also a starting lineup with option for St. G's: 4 Matildas, 1 Churchill, and 1 Cromwell. And a good start on Oarai for 4/8 of their tanks (well, splurged and got the Pz.IV platoon pack to build all 3 versions for Anglerfish). Will need to add a Hetzer option, Type 89, Char B1 bis, Type 3 Chi-nu, and a Tiger P — which kits did your brother prefer for those? I'll lean towards Battlefront if it's in stock just to support the FLGS, but then otherwise internet shopping for better options. He is coming to visit this weekend, I shall find out what he used. We wrote the rules because we couldn't find anything published that would replicate a senshado match. It would be nice to know what you think if you give them a try. I'll definitely be giving them a try at the local club, and then likely at some local conventions. This would be good to bring to Total Con, a mostly RPG/Boardgame con, but light miniatures games go over well there. And will be super for the gaming room at Anime Boston! Just found this company, they have the Chi-Nu and BT42! Todays game Anzio defeated Pravda. The Semovente took a while to drive up to the roof of the multi-storey car park but once there it swung the match. We have been playing lengthways on a 6x4 table for 10-A-Side flagtank matches and crossways for 5-A-Side elimination games. I think 4x4 would be about the smallest for a good game without changing any rules but you could try 3x3, Saunders vs Pravda could be OK. The teams with lighter tanks need a fair bit of scenery, we have not really played any games with nowhere to hide/ambush from, but I don't think Oarai, Anzio or Chihatan would do very well. 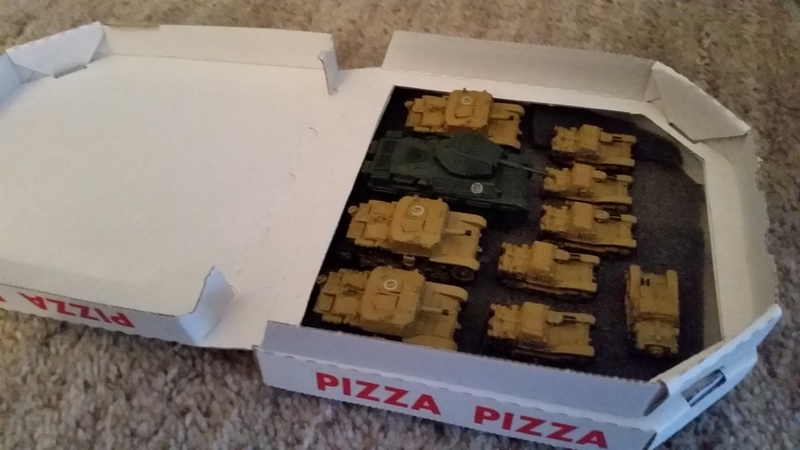 My brother's tanks; he got his Chi Nu from the place you have found, his Tiger P and Char B1 bis are Battlefront but the B1 was sold as a German tank and he did not spot it at first. His Type 89 and Hetzer are from QRF, I don't think Battlefront made a Type 89 when he got his, but they do now, looking at the skids at the back on a Battlefront Type 89 on their website he thought it looked a better model than QRF. His QRF Hetzer does not have spades etc on the side, neither do the Student Council team in the anime, the Battlefront one does, but he said if he were doing them again he might just use the Flames of war models for them all. Total Con is a great name. 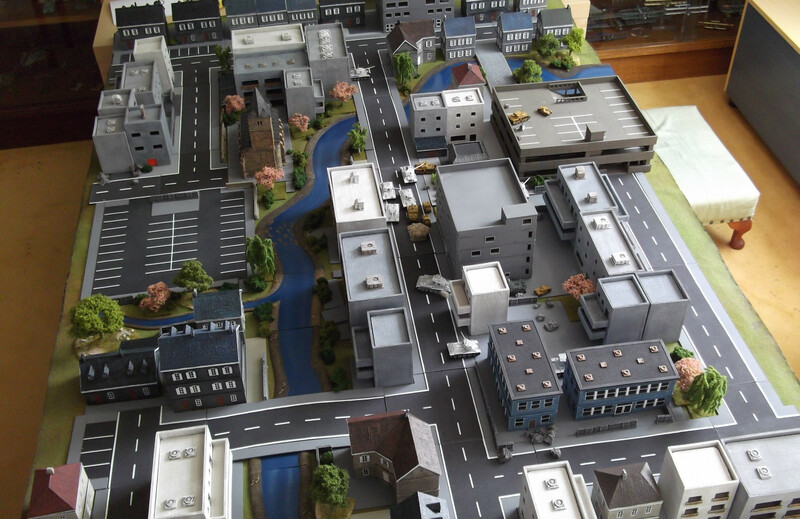 I've been looking at the Japanese N-scale buildings for gaming in the urb. Nice prices at HobbyLink Japan and 1999. Yeah, I've thinking the field would need to be at least 4'x4' for a 5-on-5. If that works, that would be good for hosting an 8-player no-elimination tournament at a con. I'll start out my trials with that once Pravda and Saunders are ready to roll. In other news, Company B is working on 15mm decals and crew figures. Been holding off on starting GuP, but it could be far too fun NOT to do. Got a bunch of Big Cat lovers in the gaming group, anyway. Damn it I didn't know they had a movie. Just finished watching it and I wish it'll never end. I'll have to get into this as well. Like the look of the rules. Whats the rule for the tankette? didn't see any special rule for them. The rules should be v3.1 from the pizza post above, tankettes are p.6. thank you. after watching the movie. written rather well! Is the rule going to be updated regularly? I'd like to follow this. Twig, could you please spell out the rules you use for 'aiming at weak points'/'aim dice' a bit more clearly for those of us reading along at home? v0 was a collection of ideas and we started pushing some models around. v1 was super simplified from v0 and we played a few games and tinkered with things until we were happy, I think we got up to v1.7 and played a couple of games and everything seemed OK so we renumbered this as v2. Then the Anzio episode came out and we started testing the tankette rules. Then the film had things like jumping and a light gun eliminating a heavy armoured Pershing that could not be done with v2. So we made changes and renumbered to v3, after a couple of test games and minor changes all seemed well with v3.1. The two versions I posted here are the ones we used for our matches as opposed to test games once we were happy. Perhaps they will never need the slightest alteration ever again! miniMo; An example, imagine you are in a Pz4D with a Med gun hiding behind a house. A JagdTiger ends its move with its side pointing toward your building, you make a short move forward a couple of inches and turn less than 90 so your turret can target the JagdTiger round the building. For a Med tank this is a short move so you can leave off the dustcloud and count as stationary for firing if you wait to shoot in the fire phase. Had the JagdTiger not moved yet it could turn in the turret phase and shoot you but as it has moved you should be safe, you aim in the turret phase and fire in the fire phase. Stationary vs moving you will throw 2 dice, both need to be 4+ to hit but the target is Super Heavy so you get +1, both dice need to be 3+ to hit. If you do hit though a Med gun vs S.Hvy armour needs a 7 to damage, which becomes 6 against side armour. To improve your chances of damaging the target you can choose to throw an extra dice to hit (aiming at weak points) meaning you will throw 3 dice all needing 3+ and get a +1 to damage, damaging on a 5 or 6. You could choose to throw 4 dice to hit and get +2 to damage, and so on "per aim dice". I hope that makes sense. Always happy to explain what I meant or hear any ideas for changes. Yes, that aiming bit makes sense now, thanks! A tank can fire its bow or mantlet MG if it has one instead of firing its main gun. Roll 4D6 and total them, needing a 23 or better to hit. +1 close (1"); only if not in smoke. +1 fired at same target previous turn; only if not in smoke. Any hit will cause a minor disruption (jammed turret-ring/mantlet, blocked vision ports, crew annoyed and shouting back, etc). The target may not fire for the rest of this turn or next turn. No other damage is caused. We wondered about the MGs too. Why do they even have them loaded when the game is against other tanks? They are sort of in the rules indirectly, you button up if other tanks are in sight (making you easier to ambush) and you cannot get out to repair your tank with opposition in sight, we thought this may be down to the risk of being machine gunned. We ended up not having them damage anything because, as you say, they don't in the series and because a tank is a tank and a MG is a MG. The Pravda tank is hit by the turret MG, are these used in WWII tanks to help aim the main gun at all? It would make sense to change direction if a MG hit could mean an opponent has you ranged in. Your rules seem nice and simple though, give them a try to see how they affect a 10-A-Side game. Some changes seem to slow the game up when you never imagined they would. If MGs can stop you from firing that is how tankettes work too. It is a real feeling of achievement when you win as Anzio and more than half your team can't actually damage your opponents. I too thought about MGs but I just went with any tank hit by MG can't use special moves, rules or aim etc. This is pretty powerful so maybe tanks can either shoot MG or main gun with MG being easier to hit with. Another thought on rules tweaks for shooting. The whole series makes a big deal on reload times. That would be reflected well if shooting went in order of lightest caliber to heaviest. Best gunners still do all their shooting first — in caliber order (Hana does squeeze off her winning shot with the Pz.IV a split second before Naomi fires with the Firefly!). Then the rest shoot. Within each caliber, initiative player shoots one first, then alternate until done with that caliber. This would explain for instance why Pravda takes an equal mix of T34/76 and T34/85, even in small matches. And it would also give the weaker schools a slightly better hope for getting lucky. That is a good idea, they stop in front of the KV2 knowing they can fire before it reloads as well. The lighter guns do seem to react quicker. Thanks for your roster sheets link this is how we got to the stats if you want to make any up. Gun penetration at 500m in mm divided by 10 = Close range in inches. Penetration at 500m; Light = below 39mm, Med = 39 – 63mm, Hvy = 64 – 106mm, S.Hvy = 107mm or more. Move, speed in kph; 50+ = 14, 35 – 49 = 12, below 35 = 10. Really slow things 2 or 4. Armour in mm, up to 34 = Light; 35 – 69 = Med; 70 – 109 = Hvy; 110+ = S.Hvy. If it has the same class side as front give it "+1 Side armour" etc. Type is a measure of agility and size, most seemed straight forward. Pre WWII slow designs are rated heavier than size alone would warrant. All the above were bumped a bit if the stats did not fit with anime performance, eg speed of the Crusader bumped up a bit, or if they unbalanced the team, eg T34/85 is Hvy not Med (also doesn't corner quite as sharply on screen), Panther gun is only Hvy (also don't knock out much on screen). That all makes sense and is good to have on hand, thanks. T34/85 at a slower speed for the extra weight of turret, gun, and ammo, and screen performance, is perfect. This weekend is our first game at the club to take the rules out for an actual test spin. I'll put up a blog post next week which will also include a review of the Company B decals. Sneak details: the decals look great! Fragile, handle with care. 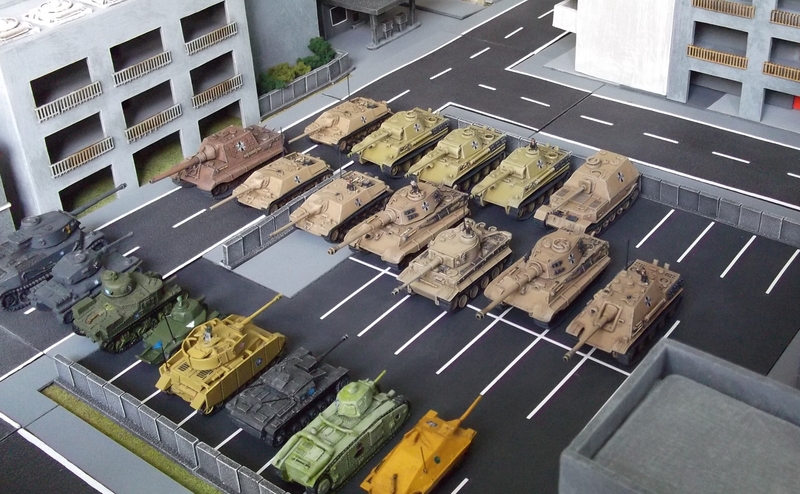 The tiny ones on each sheet are good for 10mm vehicles. For 15mm, calculate your purchases based on the large and medium sized images on each sheet. (Ooarai actually uses a few of the tiny ones.) And they have more sets available that just went online this week — I'll be ordering shortly. Sneak details on another future blog review once I get the models built and painted — for Chihatan, I went with Old Glory 15s because they have thicker barrels than QRF, more detail than Gaming Models, Skytrex doesn't have the Type 95 and their Type 97 old doesn't show the turret rail. 10 OG tanks nicely qualifies for their 20% discount. Arrived today, and I am very happy — they even include separate turret cupolas with both closed and open hatches! Hope you have a good game, what teams do you have ready? Our last match was great fun, Duck team more than made up for what they lack in armour and firepower with GUTS! Driving onto the eliminated Stug they damaged Maho's Tiger from an inch away firing from above. I am still working on my Battlefront Chi-Ha models, they take a bit of bending to get to go together nicely. It is good to know the decals are small, I am going to get some for Chihatan and Saunders and I was thinking they need to be really tiny. We played 2 games and really loved it! Saunders vs. Kuromormine, and then Saunders vs. Pravda. Both slug fests with Saunders surrounding and eventually pounding the opposing flag tanks. I'll sort through photos and get a blog post up soonish. Actually, Black Forest uses a few of the small ones — they fit the Pz.III, and the Tiger I. All of their other tanks use a pair of the large size. For the Saunders 15mm decals: each sheet has enough for 3 welded hull Shermans – 2 of the large on each side and a medium on the front fender; the cast hull M4A1 76mm uses 2 medium on each side of the turret and 1 medium on the front glacis. So for the anime line-up, 3 sheets will cover the 10 tanks. I don't have the Chihatan decals yet, but the web image looks the same size as Kuromormine: large ar about 5mm tall, medium ~3.5mm, and small ~2.5mm. And in Drama CD #5 (Japaenese only alas), Pravda files a complaint with the Senshado Federation that Jatkosota is using a captured KV-1 and the would like it back! KV-1: Type – Hv, Armour – Hv, Move – 12", Gun – Hv, Close – 6", -2 Rear Armour. T-26: Type – Lt, Armour – Lt, Move – 10", Gun – Md, Close – 4". BT-5 and BT-7: Type – Lt, Armour – Lt, Move – 16", Gun – Md, Close – 4", Wheeled move 16"*. Created a new movement class of 16" for speeds of 65+kph. BT-7 has marginal armour improvements over the BT-5 and longer operational range and endurance, but no improvements that warrant any stat boosts. Same Christie drive and wheeled option as the BT-42. Team Skill: "We live in the snow." Any location in the snow counts as out of the opponent's line of sight for deploying sneaky tanks. That's great, I have updated the list. I have been reading Ribbon Warrior and started working on a totally new set of rules for Tankathlon matches (unofficial matches, the only rule being tanks must weigh less than 10 tons). The little tanks are mostly off the light end of the scale, enough for machine guns to work against them. These optional rules are to use them in this game. Very Light Guns are below 19mm penetration at 500m making Light Guns 20 – 38mm. MMG are around 30 Cal and HMG around 50 Cal. Very Light Armour is up to 15mm thick. They seem a good option for games focusing on light tanks or if you want to use tankettes as normal little tanks, ignoring the Tankette rules. I like the new skills, they make the rules over 8 pages, what to do? Yes, a doc is easier for me, and I can add notes for further tanks as I work them out as needed. I've been reading Ribbon Warrior too. The 5th book just arrived from CD Japan the other day. Although, I'm still working on teaching myself Japanese so I can actually read it and other reference material! But also reading the English translation online as that catches up with the story to date. Already collecting light tank models, great to see the rules! With Tankathlon in mind, got a trio of 38(t)'s for Count's roster. I'll build Blue Division's pair of BT-5's with early style turrets from Game Models on Zvezda chasses and clip their fenders back, that should bring them in at 10 tons. I put in a request with Arctic Skunk on Shapeways (Tachikoma here), he's added the modified Type 87B to his shop! I'm just waiting for Shapeway's big Cyber Monday Sale to put in my next order there. I'll likely add in one of his Strv M/40L models for Viggen to bring to Tankathlon too. I am half way through Vol 5, it is only the second manga story I have read without furigana, I am OK with hiragana and katakana but I need to learn more kanji, it is slow going but fun. It took me hours to realise the name of Kuromorimine's team, Shu-ba-ru-tsu-ba-ru-to Ka-n-pu-gu-ru--pe, is Kampfgruppe Schwarzwald! I hadn't thought of looking on Shapeways, thanks. I want to see if Tachikoma makes a 1/100 Tachikoma now. You're doing better than me — I'm up to reading the SFX! But I just got my Kana From Zero book about two months ago. And my first kanji book is en route now from ABE.com. Have you found any dictionary that's particularly helpful with the tanky jargon kanji and words? I already bought his regular Type 89B. Sweet model, I weighted it down with BBs. I've just barely started painting Ooarai — been gathering models from so many different sources for that team. On my shopping list for the big sale is a 89B mod, Verdeja I, Pz.NbFz VI, Stridsvagn M/40L and probably an M/42 too. Thanks for posting the doc versions! Katakana SFX tokens is a brilliant idea. I don't know of any tank phrase book, I have a square lined notebook I write words I don't want to keep having to look up in, usually after I have looked them up a few times. My brother often orders 1/144 biplanes from Shapeways and he is in charge of Oarai, perfect. I am wholly out of my depth giving advise on learning Japanese. So here goes, once you have learnt what the kana sound like (I found a deck of flash cards helped, add a few every day) get a manga with furigana. They make everything easy, well easier. I found books and newspapers difficult to tell where one word ends and the next starts to begin with, manga are easier somehow. A story without too many foreigners or country folk with odd accents is best. I worked my way through Japanese From Zero books 1 – 3 (which took me a couple of years!). It was only when I got to book 3 I started kanji, by then, with furigana-manga the kanji for things like da-i-jo-u-bu seemed familiar from reading the kana written by them. To look up kanji I use the Kodansha Kanji Learner's Dictionary, they are catalogued by shape then stroke count so, for example, the first kanji of Kuromorimine is a top-half, bottom-half shape with 7 strokes above 4, with furigana it will have ku-ro written next to the kanji and you can look it up in any dictionary. Either way you will need a microscope, main thing keep going. I am finding Ribbon Warrior particularly challenging. No furigana, lots of French and German written in Japanese, characters who speak with an odd turn of phrase, a main character who gets carried away and slips into ancient samurai Japanese during battles. My dictionarys have no mention of the traditional art of horseback dog hunting! The tokens should be a particularly big hit for running games at Anime Boston. And I've made Shrinky Dink tokens before for Dragon Dice spells — very time-consuming project, but very sparkly results that add tremendous flair to the tabletop. Yes, I already have a small binder that holds index cards to make my own vocab lists. That's a study tool I found very handy with Greek and Latin. I have an ever-growing little notebook with epithets for all the Greek deities. For starting manga, I've picked up Chi's Sweet Home, and a couple of volumes of Polar Bear Cafe. But also digging right into Ribbon Warrior and Gekitou! Maginot-sen desu!! for whatever tidbits I can pull out. The 1/100 Swedish ones pop up under the Swedish heading, but not the general 15mm link. Here's a couple of docs you might find handy. I compiled all the scanned images of the Gekkan Senshado 63rd Tournament matches, and then articles on other schools that weren't in that tournament. This is where I got the roster info. And they have been a big help for quickly figuring out the Japanese names for the tanks. The images were longer than US Letter sized, so I created the documents at Legal sized. They are big image-heavy files, will take a bit to load. I printed them out for a hard reference copy.